Hydrangeas are not only beautiful with boasting color but can be transformed with a touch of care. Kickapoo Creek Nursery has a selection of hydrangea plants you can try this trick including “Let’s Dance”, “Pink Diamond”, and “Endless Summer”. Hydrangeas are a popular plants that grow everywhere in the world, produced from early spring to late autumn. These shrubs will bloom flowers, carried in bunches with a nice light floral scent. 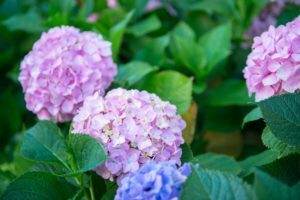 Watering your hydrangea plants is essential because they thrive in rich, porous, somewhat moist soils that receive will full sun. As far as where to plant a hydrangea bush, you will want to give plenty of room. Hydrangea bushes will grow with great height and width covering a large amount of space depending on the variety. If you are looking to make your hydrangea plant a vibrant pink color, you will want to keep the ph value above 7.0. Ground lime is an excellent option for helping boost the acidic value in the soil. By adding short bits at a time will ensure your plant to absorb the nutrients needed and will gradually start turning a more vibrant pink color. Now to get that lush blue color, you will want to lower the PH value under 6.0. To bring your soil to a basic level, proceed to add garden sulfur or aluminum sulfate to your soil mix. Do you drink coffee? You can you use your old coffee grounds to do the trick too! Simply mix them into your soil and the color of your flowers will slowly start turning a bluish hue. Need help testing how to change the soil type? Take a sample size of soil in a container and pour distilled white vinegar in the mix. From there, if your soil starts fizzing you know that the ph level is high and the soil is alkaline. If not, this means that your soil is neutral or acidic. This makes for an easy transition if you are looking to change the color of your hydrangeas blue. Either way this change will take time and patience, as it could take a couple months to see the color you want. This fun experiment will give you the perfect color along with the excitement of being involved in the process!